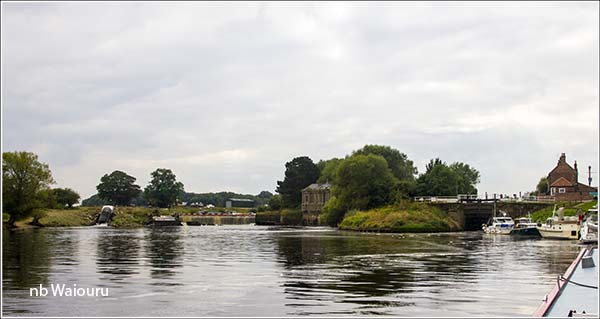 There isn’t much we can say about the journey north up the River Ouse from York to Linton Lock. A wide and winding river with flood banks and trees on either side. Oh there were a few interesting boats moored in isolated locations. This appears to be very much Tupperware country. As we got close to Linton Lock two large fibreglass boats caught up with us. I waved them on to pass us but they hung back calling out that the river was very shallow around the bend. So we were the first to arrive at Linton Lock. 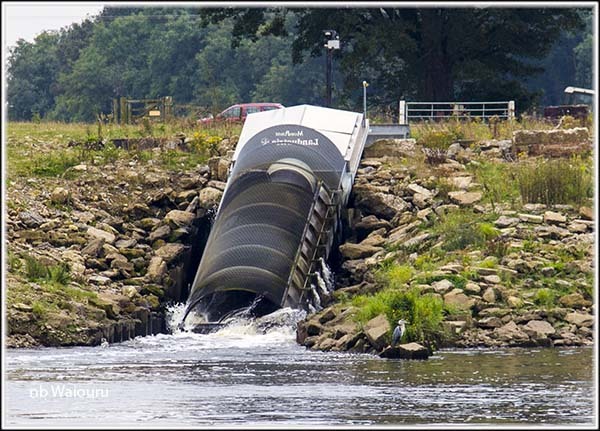 The first thing I noticed was the operating Archimedes Screw to the left of the weir. I’ve seen many drawings of the screw and even a number of models. However this is the first working screw I’ve ever seen. The lock is to the right of the weir. The fibreglass boats moored in front of us and we were all waiting whilst another small Tupperware came down. Things then became even more interesting when a huge barge came around the bend behind us. My first thought was “He’ll never fit in the lock?” However the lady in the bow called out that they intended to wind (turn around) below the lock. 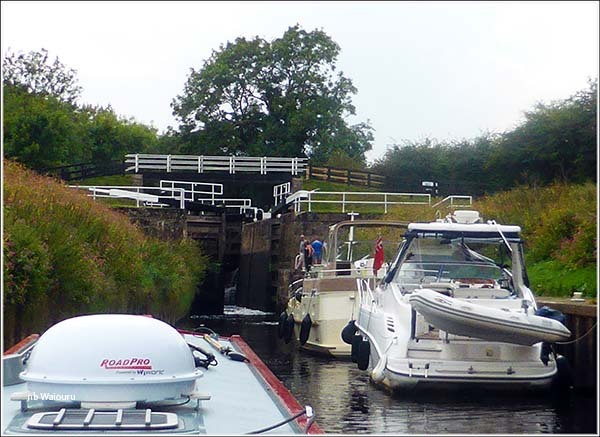 Whilst we were prepared to let the two fibreglass boats go up through the lock first they insisted we go in as we’d been the first to arrive. The first thing I noticed on entering the lock was the lock walls weren’t vertical. The lock was wider at the top. It also looked very short. I managed to fit the bow unto the centre of the lock and then get the stern to one side. This allowed the gates to be closed behind Waiouru. Once inside the chamber there was more fore and aft manoeuvre room. Jan filled the lock very slowly using only one paddle. We don’t want any accidents! Once out of the lock we made good time towards Milby Lock. Somewhere along the way the river changed from the Ouse to the Ure. 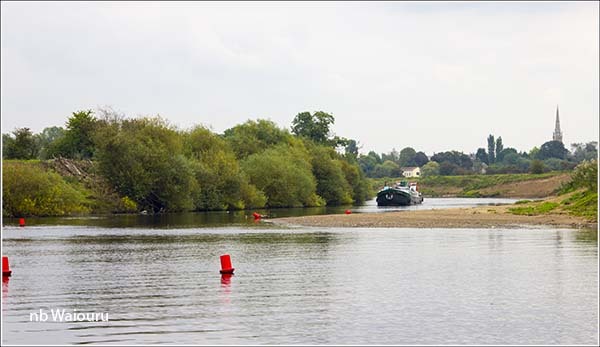 We were in the long channel approaching Milby Lock when the two fibreglass boats caught up with us once again. We moved to one side to let them pass us. We reached the lock 3rd in the queue to find a narrowboat was attempting to come down. I was back on Waiouru and didn’t understand what was causing the delay. The crews of the fibreglass boats then decided we should go first. They’re very friendly around here! 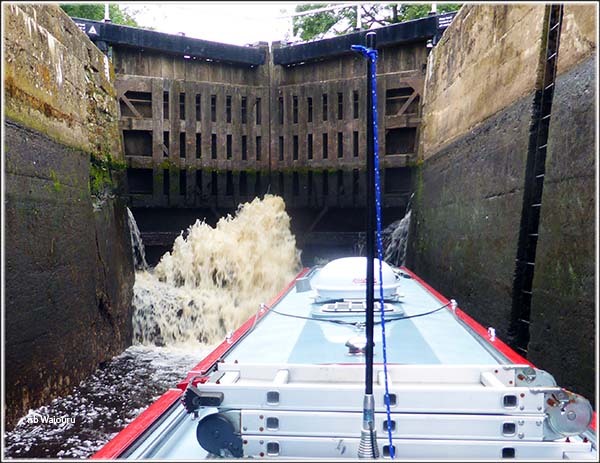 When I approached the lower lock gates I could immediately see the problem. The water was gushing out from underneath the top left gate. To avoid flooding the cratch I positioned the bow to the right side of the chamber and then manoeuvred the stern to the left. The lower right gate could then be closed. The crews of the other two boats then worked us up. What we didn’t realize was a hole existed in the right side lock wall at the bow and our gunwale caught in it. It could have been quite dangerous if the gunwale had been snagged. However what happened was the cratch cover ripped freeing the bow. So that’s both sides of the cratch cover requiring repair. It was only a short cruise from the lock to the moorings at Boroughbridge. Tonight’s mooring is opposite the CRT facilities block and a very short cruise to the Canal Garage (grey building) which sells red diesel. We might just buy some tomorrow. 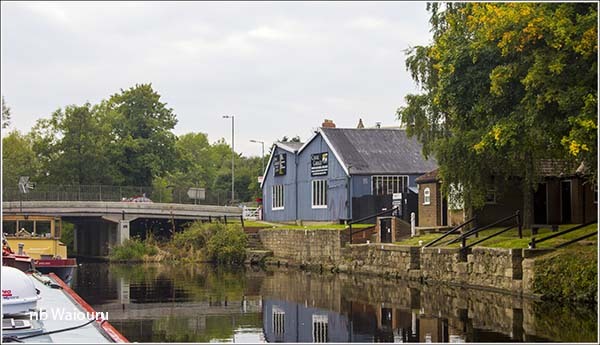 We found that the garage fuel price was very expensive, the cheapest we found was York Marina, in-between York & Naburn. That's useful information. We're going back that way! When coming back down Milby lock shut that leaky gate first then the other one will leak instead but not as badly!